. Fast and efficient. While we successfully integrated the VCSA to the Windows domain and we could see the computer account in the AD, we still had to log in with the default VMware credentials (root/vmware) to the VCSA. Now it's time to finish the configuration and allows the possibility to use Single Sign-On and centralized logins by leveraging Windows AD. 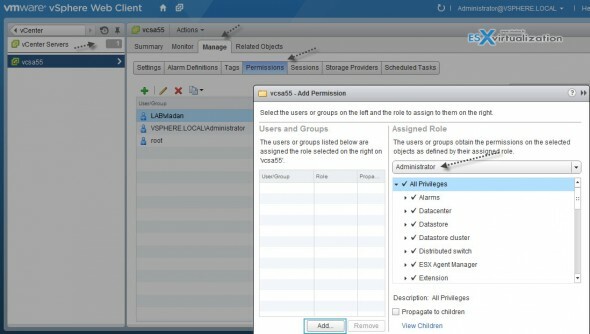 So that's why this article about VCSA 5.5 Installation and configuration – part 2. By default you see the default vSphere.local domain and localOS authentication that are those default ones. Now when this done you should end up with a screen like the one below. An additional Identity source has been added – our lab.local domain. Good, but that's not finish. It still require one more step. 03. Click the Groups TAB, then Select Administrators group. Then see the image for additional steps. I'm using my own AD account called Vladan, which is member of the Domain Administrators group in my Windows domain. Next you'll see a view like this. You click on Manage TAB > Permissions > Click the green Plus button and Click the Add button. Now what if you want to give a less privileges to a user or a group of users? You can of course add not only users, but also groups from AD. 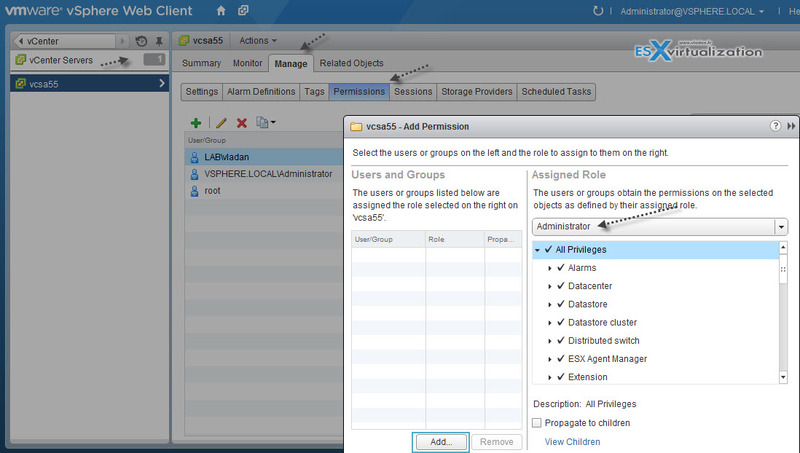 And you can add users/groups with less privileges if you want them just to manage some VMs. For example I've created (in my AD) a group called Students and put an AD account called student. I want this user only to use a VM, but nothing else..
And we can verify that the user cannot delete our VM…. Now, this is not new in vSphere 5.5. 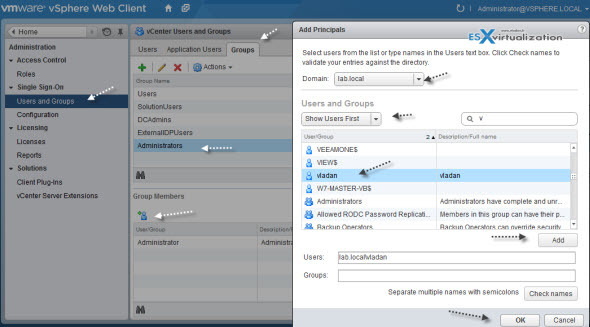 The administration of users, groups, and roles is part of the vSphere since the beginning. But the web based interface make doing things a slightly different ways, so I don't thinks its a bad to re-hash a bit…-:) Plus, there is still new folks which are just starting with IT, virtualization, and learning more about VMware techologies. That's why also this post was born. Did you like this post? SHARE it through any of those social networks -:). is vcenter 5.5 available to download right now? I’ve just installed vcenter 5.5 appliance and when trying to configure users from AD DS (on SSO -> Users and Groups, click on Groups then Administrators and on bottom i’ve icon with plus) got screen Add Principals, and when changing domain to my AD DS domain i have empty list and got alert: Cannot load the users for the selected domain. Why? What i’ve done wrong? Difficult to say. Normally it should populate users and groups from AD. Have you logged in as [email protected] ? In my case the first DNS server entry was my firewall. Which does normally route dns request to my Active Directory pretty fine to the domain DNS servers… but not in this case. To solve the issue I set only the Active Directory DNS servers in the network settings of my VCA. for me it was the same, go on again with users and user groups and then choose your domain. With the filters I’ve found my account. Then simply go again to the Administrators group, and then you find yourself when you select the domain. However, I can not !!! login with an AD user on WebClient. He says the password is incorrect. Is the syntax wrong? Is there any way to invoke some Windows vCenter 5.1 configurations like resource pools, vDS and other important “time eating” things? If external SQL is/will be supported that could be done, but how to make conversion to embeded DB? Not quite sure what you’re referring to. The only limitations that’s not supported with VCSA is linked mode. Also vCenter server Heartbeat isn’t supported with VCSA. VUM has to be installed on separate Windows box, the same for View composer. ANd SSPI (security support provider interface) – Microsoft Windnows API used to perform authentication against NTLM or Kerberos. The limits (soft) of 100 hosts and 3000 VMs has also been confirmed. I could not retrieve the list of domain users, until I added the PTR record of my Domain Controller. You really helped a lot understanding the way it works. Thank you Petros and Vladen. The last piece of he puzzle finally solved. Reverse Lookup zone and DC PTR records did the trick. Excellent article really help a lot for me. Keep up the great work!!! First let me thank you for this article. It is excellent and succinct.